On December 11 and 12, 2013, Japanese organizations engaged in the struggle for asbestos justice operated a telephone consultation service for asbestos victims and their relatives from Tokyo, Sapporo, Nagoya, Osaka and Ehime  well-known asbestos hotspots. The service provided by the Ban Asbestos Network Japan, Japan Occupational Safety and Health Resource Center (JOSHRC) and the National Association of Asbestos-related Disease Victims and their Families was contacted by a total of 293 callers from all over Japan. Japan was formerly one of the world's biggest users of asbestos; long after the use of crocidolite and amosite asbestos had been banned in other industrial countries, consumption continued in Japan. In 2005, the existence of a national epidemic of asbestos disease was finally acknowledged when major companies announced that former employees had contracted asbestos diseases. This revelation was widely covered by national and local media and became known as the Kubota Shock. In the aftermath of the Kubota Shock, Japanese Ministries were ordered to publish available, if limited, data on the incidence of asbestos-related diseases. The Ministry of Health, Labour and Welfare disclosed information on businesses and shipyards where asbestos-related diseases had been recognised as occupationally-caused by the Workers' Compensation Insurance Scheme. This included the name of each business /shipowner, the address, type of work conducted that caused exposure to asbestos, the duration of asbestos use, the status of the business (ongoing or closed), the number of compensated cases of each asbestos-related disease and other information. The Ministry had intended the 2005 disclosures to be a one-off service however, an aggressive campaign by civil society activists led to the reinstatement of this service in 2008 when, once again, this information was made public. 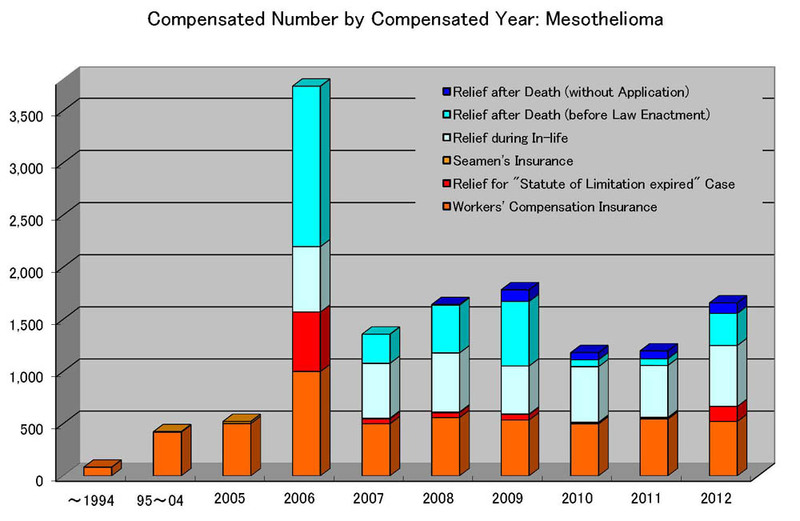 in recent years, rates of compensation have varied significantly from year to year with 70.9% of mesothelioma claims being compensated in 2005 while only 63.1% were compensated in 2012.
the implementation of outreach programs to target populations  i.e. construction workers and workers in other at-risk sectors as well as people who lived near asbestos processing factories, etc. a timetabled plan to eradicate asbestos contamination from the infrastructure and environment in Japan. For decades Japanese citizens have been dying in vast numbers because of a political and economic regime which encouraged the use of asbestos. Long after many countries acknowledged the risk and banned its use, the Japanese asbestos lobby maintained control of the national debate on asbestos. Although the final use of asbestos was prohibited in 2012, deaths will continue for generations to come due to past exposures and future exposures to asbestos hidden within our infrastructure. We cannot and will not be complacent  the fight for asbestos justice will continue until the day when Japan is asbestos-free and there are no more victims of asbestos.